Mazda may be going kicking and screaming into the hybrid game, but don't think they're opposed to electricity. They've found a nifty and efficient way to harness it on the 2014 Mazda6 with a regenerative braking technology they call i-ELOOP. Let's break it down! i-ELOOP stands for "Intelligent Energy Loop," and it's a capacitor-based regenerative braking system that converts kinetic energy into electricity as the car decelerates, not unlike similar systems on racing cars and hybrids like the Prius. 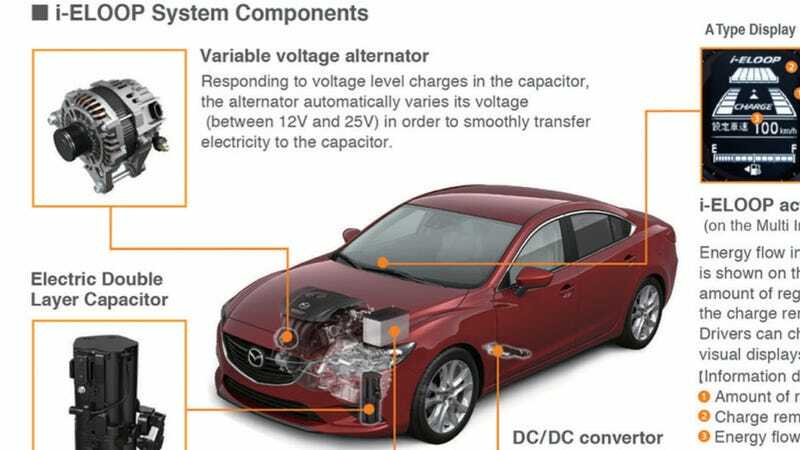 But instead of going to a battery pack that drives an electric motor the way a hybrid would, the electricity here is stored and then used to power the Mazda6's electrical components, like the headlamps, climate control and stereo. Conventional alternators are constantly charging the battery in an effort to keep up with a vehicle's electrical loads, which means using engine power to operate the alternator, which, in turn, consumes fuel. With the i-ELOOP system in operation, the alternator is free-wheeling, creating almost no parasitic drag on the engine, which reduces the amount of fuel used. Upon vehicle deceleration, the engine and alternator continue to spin as the vehicle slows down, working off of the vehicle's inertia. To take advantage of this free energy, i-ELOOP's special variable-voltage alternator kicks in and generates short bursts of electricity that is stored within the capacitor. The capacitor then meters power out into a smooth, continuous flow to satisfy energy loads. Mazda says this reduces the car's need to burn fuel to power the electrical systems, resulting in a slight bump in fuel economy. Sixes equipped with i-ELOOP are rated at 28 mpg in the city, 40 mpg on the highway, which is 2 mpg more than the normal car can make. More good news if you've been thinking of getting a Mazda6, too: the six-speed manual transmission is now available as an option on the more upscale Touring trim, whereas it was previously only on the bargain Sport level. The 2014 Mazda6 starts at around $20,990 and jumps up to $23,645 for the manual-equipped Touring. Who needs a hybrid when you can have one of these?